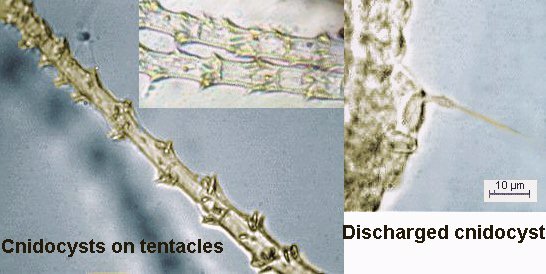 Unlike bryozoans, in the Cnidarian phylum (including jellyfishes), the tentacles are often more numerous but NOT ciliated. They have defensive structures called cnidocysts, (or nematocysts; the first name is derived from Greek, meaning 'nettle'), which are used to catch prey by injection of paralysing venom. Cnidocysts are cells containing filaments which are suddenly ejected when a prey touches a trigger hair. On closer view of a tentacle, cnidocysts are seen to be more numerous near the tip. 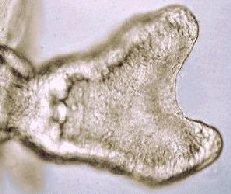 Note that cnidarians don't need to have defensive zooids; cnidocysts are highly dissuasive and in some species, individuals can also retract. It's possible to make the cnidocytes discharge by the addition of very dilute acetic acid (3 to 5%). 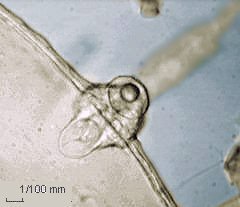 In the picture above (taken with a X40 objective but total magnification is around X1400) you can see the thread, which is normally coiled inside the nematocyst cell; this cell is at the base of thread after its discharge. The thread is violently ejected and pierces the epidermis of the prey to inject paralyzing toxins. 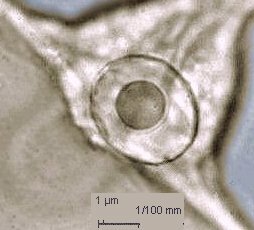 Appearance of cnidocytes is useful to class the species of cnidarians. The four classes of cnidaria are: the Hydrozoa (e.g. the well known freshwater hydra); the Scyphozoa (jellyfish and soft coral); the Anthozoa (sea anemones and hard coral) and the Cubozoa (sea wasps and several other genera). As for the bryozoans, in the Cnidaria phylum, some individuals (gastrozooids) are specialized to catch food and others (gonozooids) for reproduction. Reproduction by budding exists too. (See picture below). 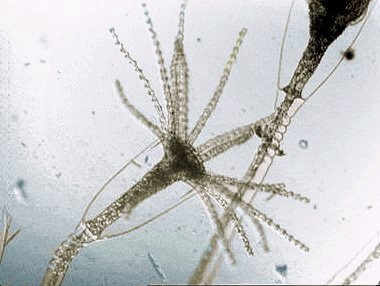 Obelia is a well known example of cnidarian. The picture below illustrates living hydrants (hunting individuals); this name has the pleasant meaning "water flowers". Here are two pictures from a mounted eosin stained slide of gonangium (reproductive individuals). 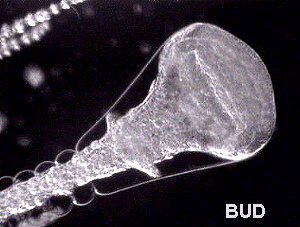 During reproduction an intermediate stage can exist; it is a swimming jellyfish, called the medusa, which hatches from the gonangium. The medusae have gonads producing eggs and sperm. Fertilised eggs gives a larva called a planula, (looking like a flatworm), which then form a new colony. All digestive systems are connected between individuals to form a gastro-vascular cavity named the coelenteron. Particularly in obelia, it's easy to see particles moving up and down within the stem between the individuals joined through the transparent stalk. The stalk is comprised of: an external chitinous envelope, the perisarc which is secreted by the epidermis; containing living tissue, the coenosarc; and an inner part, the ciliated gastrodermis. ( See video clip, showing particles moving within an obelia stalk). The coelenteron is used to transport fluid and partially digested particles through the colony. Note that the perisarc forms an annulus above the hydrant. The cavity where it lives is called the hydrotheca. An Obelia medusa is a very interesting subject for observation, because all the structures are transparent. The picture left shows an Obelia medusa (living). In the centre of the umbrella, is the manubrium (mouth) with four short oral arms (see detail in image below). Under it, is located the stomach which is connected with four channels to a peripheral circular ring near tentacle base; some moving particles can be seen on it. The four gonads are clearly visible. Right hand picture shows the manubrium, four oral arms closed and below, mouth open. Each channel has a gonad (see image detail below). 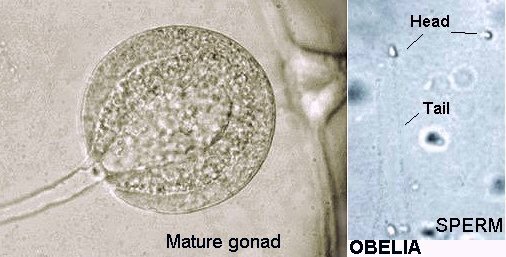 One time, during observation, a gonad has ejected sperm on the slide. 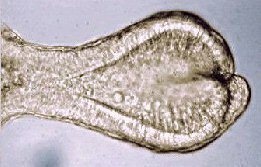 The picture was taken with X40 objective and of poor quality, but the spermatozooid triangular shaped head is clearly visible. It's astonishing to see that primitive animals can have spermatozooids similar to mammals! 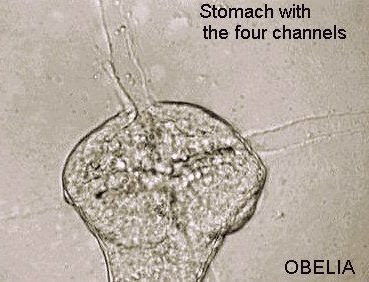 Near the base of some tentacles, little spherical structures appear, each is associated with three tentacles; they are statocysts, or equilibrium organs which are constituted of little bags filled with liquid in which move a rounded statholith made by crystals of calcium salts. 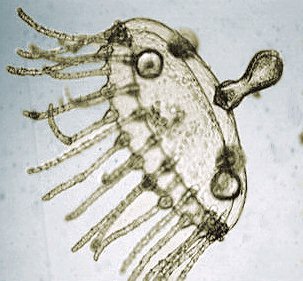 It seems that in some species, planula can develop into jellyfish like that shown in the picture below. In other cnidarian species, the planula is directly produced by specialized zooids near the stem base. Cnidarians are very interesting to study and their reproductive cycles are fascinating. Their chitinous exoskeleton can be easily mounted and preserved and eosin stain works well. If you want to preserve live individuals for some days in a jar, you must take them with their support. Otherwise, the gastrovascular cavity is broken and they don't live for more than one day. If you are lucky, you will see some jellyfish stages (medusa) directly produced in your jar ! To learn more about bryozoans, cnidarians and invertebrate anatomy see text and drawings at : Richard Fox's page, Lander University : http://www.science.lander.edu/rsfox/310labindex.html. Don't miss "Laboratory techniques" and "Recipes" on this web site! Published in the May 2001 edition of Micscape Magazine.